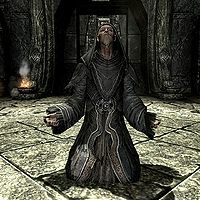 Arngeir is a powerful Greybeard elder who lives atop High Hrothgar. He tutors you in the art of using the Voice and acts as the Greybeards' representative, in that he is the only one of the four who can speak safely. He is the right hand of Paarthurnax and has taken it upon himself to zealously guard the Throat of the World. Arngeir's schedule consists almost completely of meditation; he never eats any meals and will only stop to sleep. He rises at 2:30am and meditates at each of the windows in the western hall before moving out to the courtyard at 4am. He may either meditate by the fire or in the center of the grounds, or he might practice shouts in various locations. At 8am, he will go indoors and meditate in the main hall until 4pm, at which point he will switch to meditating at the windows in the east and west halls. Arngeir goes to bed at 10pm in any of the beds available. He wears a set of Greybeard's robes with the matching hood and boots. He carries a copy of the book Spirit of Nirn, one honeycomb, and one fruit or vegetable, as well as some butter. Arngeir knows the following shouts: Disarm, Fire Breath, Frost Breath, Ice Form, Unrelenting Force, and Whirlwind Sprint. Through the quest The Words of Power, Arngeir can provide you with word wall locations. Arngeir is the only Greybeard who can freely speak, whereas the other three Greybeards cannot even whisper without causing an earthquake. This is because he is the strongest of his fellow Greybeards (excluding Paarthurnax) and has learned how to control his voice and speak normally. He is voiced by Christopher Plummer. He is the highest level NPC in the base game at level 150. With Dragonborn installed, Miraak can reach the same level. For no apparent reason, most of his schedule changes occur at five minutes past the hour rather than on the hour like most other schedules in the game. This page was last modified on 8 July 2018, at 00:03.